1. Warm the olive oil in a deep frying pan over a medium heat. Add the onion, fennel and garlic and cook for 10-12 minutes until softened. 2. Increase the heat and add the tomatoes. After 5 minutes add the wine. Cook for 5 minutes more, then stir through the tomato purée. Add the stock and simmer for a further 5 minutes until slightly thickened. 3. Season the fish, then place into the pan, on top of the sauce. Cover and simmer gently for 2-3 minutes. 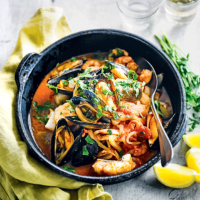 Add the remaining seafood, cover and cook for a further 3-4 minutes until thoroughly cooked, the mussels have opened (discard any unopened shells) and the prawn shells are pink/red and the prawn flesh is white/pink. 4. Scatter with the parsley, season and serve with the lemon wedges to squeeze over. This is traditionally served with polenta or crusty bread and is also delicious with a green salad.